Marriage - Preparation Guidelines - "Your Wedding Day"
The Catholic Church believes that Christian Marriage is a sacred covenant that fulfills God’s plan for humanity—that it is a relationship between two persons bonded in a permanent union. Our Church desires that couples enter into marriage with the highest degree of freedom and knowledge about the vows they will exchange before god and humanity. 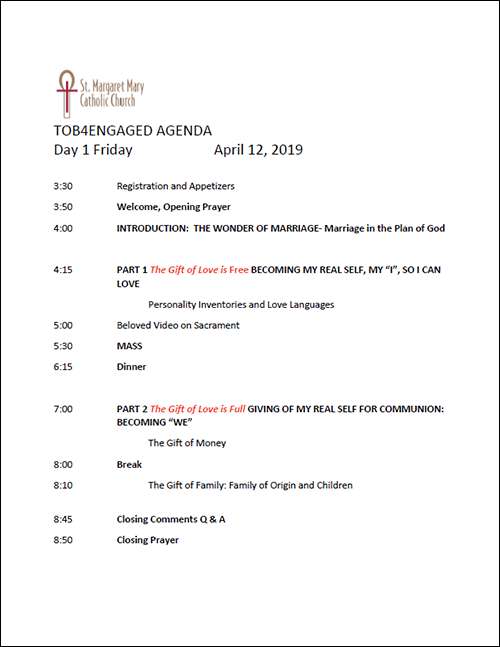 Here at St. Margaret Mary our marriage preparation process is designed to help couples “begin with the end in mind” and to better understand the challenges they will encounter in their marital relationship. Couples desirous of celebrating their marriage ceremony at St. Margaret Mary must contact our church office a minimum of six (6) months in advance of your anticipated marriage date and be officially registered at our parish for a minimum of six (6) months prior to beginning your marriage preparation. At least one of the parties making application for marriage must be a baptized, practicing Catholic. The couples are asked to take the FOCCUS inventory. First developed in 1985, the FOCCUS (Facilitating Open Couple Communication, Understanding and Study) Pre-Marriage Inventory, is widely known and used by marriage educators in a variety of settings in the United States and around the world. Research based and offered in multiple editions and languages, the Inventory addresses the relationship challenges faced by today’s couples in a user-friendly format at a reasonable price. Couples complete the FOCCUS Pre- Marriage Inventory and then participate in facilitated discussion on key topic areas. They also have the opportunity to review, reflect and discuss together particular strengths and growth opportunities within their relationship as they prepare for lifelong marriage. The FOCCUS Pre-Marriage Inventory is not a test and is not meant to label couples or predict marital outcome. The Inventory was developed for use with engaged couples of all ages, those preparing for a first or subsequent marriage, couples marrying within a faith tradition or a civil ceremony, and couples who may or may not be bringing children to the marriage. The couple is then given an interview with a priest or deacon of their choice. At that meeting the priest or deacon gives them an overview of the church’s expectation for their marriage. In most situations, this is the priest or deacon who will officiate at the marriage ceremony. During a subsequent meeting the priest or deacon shares the result of the FOCCUS inventory, discusses the date for their marriage, completes the necessary paperwork for ongoing preparation, including sessions with a married couple to discuss the FOCCUS inventory, and the 2 day marriage preparation class at the parish. All necessary documents are also collected at this time. Subsequent meetings with the priest (or deacon) can be arranged when seen as necessary. The marriage preparation class at our church is an expectation for all couples who desire to make Christ the center of their relationship. We welcome those who are engaged for the first time and those who are civilly married, even for a number of years . 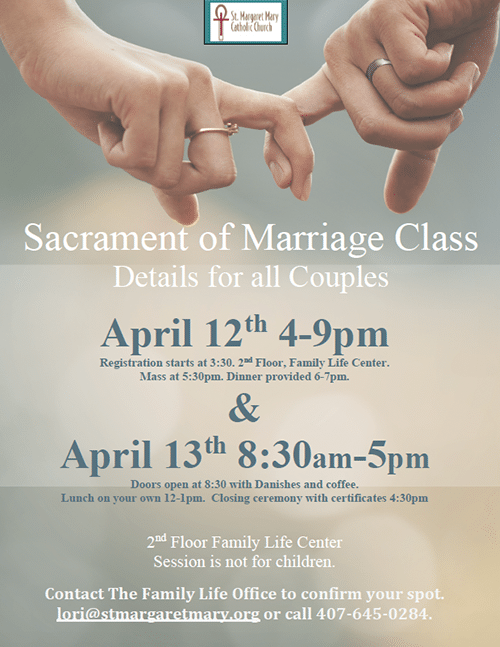 Our preparation class provides couples with the skills and resources necessary to nurture their covenant and thereby create a healthy sacramental marriage. Our class is interactive in nature, offering each couple time to discuss information privately as well as with a small group of fellow travelers. We strongly believe in the support of the community for married couples and also believe that your marriage can be a gift to the larger community. Specific topics addressed in this class include: communication, spirituality, money and practical issues, family of origin, personality differences, intimacy and sexuality, values, and parenting. Special consideration is given to 2nd marriages, those who are parenting outside of marriage, and those who desire a shared faith- but come from different faith backgrounds. It is a day filled with tools to build a marriage that is holy, healthy, and permanent! This class is 10 hours in length, and offered in the spring and fall each year. Classes are held on Friday evenings from 4-9pm and continues on Saturday from 8:30am-5:00pm. The classes are held on the St. Margaret Mary campus and both members of the couple must attend to complete this requirement. Fees for this class are included in the marriage fees discussed with the priest’s office. Next Class will begin on April 12, 4-9pm AND continue on Saturday, April 13, 8:30am - 5pm at St. Margaret Mary. Classes are usually offered three times a year: August, January and April. All couples must contact Debbie Benson to begin the Marriage Preparation process, at (407) 647-3392. An understanding of a Church annulment has to be based within the Church's teaching of the Sacrament of Marriage. The Catholic Church teaches that marriage is a community of life and love, an enduring partnership between a man and a woman for the giving and receiving of love and for the procreation and education of children. Marriage is a permanent and exclusive covenant, an interpersonal union which extends to the couple's total life together, to physical, emotional, intellectual and spiritual community, and to the procreation and education of their children. An annulment ( also called a "decree of nullity") is a judgment of a Marriage Tribunal of the Catholic Church concerning the invalidity of a particular union. If an annulment is granted, it means that in the eyes of the church a basic element was missing from the union in question from the very beginning, and that on account of this, it was not a valid sacramental marriage from the start. The annulment does not deny that a real relationship may have existed, nor does it imply that the union was entered with ill will or moral fault. Rather, an annulment states that the relationship fell short of at least one of the elements seen as essential for a true, valid Christian marriage. Finally, an annulment does not seek to establish guilt or innocence, but rather validity or invalidity. There are many people attending Catholic parishes or in Catholic families whose marriage is somehow not fully recognized by the Church. Catholic Church law ordinarily requires baptized Roman Catholics to marry before a priest or deacon. Unless they requested and received a "dispensation from canonical form," Catholics who exchange marriage vows in the presence of ministers from other religious traditions or authorized civic officials are not considered having a valid, sacramental marriage. If you are in need of your Marriage certificate you can fill out this form: https://stmargaretmary.org/sacrament-certificates and we will be happy to help.